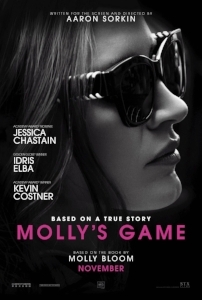 Writer/Legend Aaron Sorkin (The West Wing, The Social Network, Moneyball, Steve Jobs, A Few Good Men) delivers his directorial debut with Molly's Game - starring Jessica Chastain (Zero Dark Thirty, Miss Sloane) and Idris Elba (The Dark Tower, The Wire). Sorkin delivers the goods - sizzling dialogue from top-shelf actors at break-neck speed. Sit down, strap in, and hang on.